Jos. A Bank has reduced their clearance section an extra 50% off! Today and tomorrow, dress shirts and sportshirts are starting at $9.99! 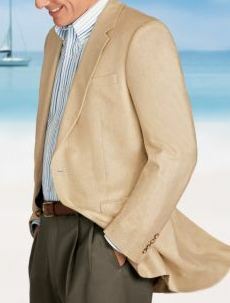 There is also a great deal on the Tropical Blend 2-Button Linen/Cotton Sportcoat. Regularly $450, now just $49 after coupon code EXTRA. These are great quality and you can find some great deals for dressy clothing!